If you want to fall asleep, read the details of each section. But in summary none of the testing involves the wiring harness EXTERNAL to the headlight assembly, or the portion that is on the car. So it seems the HIDPlanet poster is incorrect with his statement of "Second, the OEM headlamp wiring harnesses in vehicles that were built without an HID lighting option, were most likely not designed to handle the electricity needed to ignite the Xenon gas, which could lead to a short in the wiring and possibly a fire; Therefore, it is assumed by NHTSA that any vehicle produced without an HID lighting option is a safety hazzard when HID lights are added." This covers what the OP is trying to do, not using a projector based system. Think about it. If the HIDPlanet guy was correct, then NHTSA would have to have each model car in the testing lab to ensure the safety of the wiring or they'd have to have it built into the testing protocols an automatic failure of HID products for non HID equipped cars. They don't have every model car in the lab nor do they have built into the testing protocols what the HIDPlanet poster concludes. "The only safe and legitimate HID retrofit is one that replaces the entire headlamp—that is lens, reflector, bulb...the whole system—with optics designed for HID usage. In the aftermarket, it is possible to get clever with the growing number of available products, such as Hella's modular projectors available in HID or halogen, and fabricate your own brackets and bezels." So as long as the entire system is designed and tested for HID usage (and you don't then put glass in front of the resultant assembly), you are good to go. This is why I used the Hella modular projectors referenced above in my retrofit. As an aside, check out the section on vibration testing. This is why I kept recommending you increase the thickness of the wiring in your GB led taillights. This is how I have my lights hooked up. I do agree with you that this is all moot as the OP is not a manufacturer so he does not care about this stuff. I'd think he would care though about his own safety and of those he is blinding which is why we've all encouraged him to sell the illegal and dangerous equipment and go for a projector based setup. It won't technically be legal but it would be drastic improvement over what he is doing. New housings are in but I have to work untill next weekend so no testing will get done till then. If I understand it correctly, you've invested $940 into your kit: $370 for the HIDs and $540 for the glass lenses. That is a lot of money for a kit that does not have a proper cutoff and will not be safe for you or others on the road. I say this with respect, have you considered what we've posted here? I'm all for mods on a car, but one that cannot be safe is not good nor worth pursuing any further. Yes, you can make the lights work but you will end up with something you should not use anyway. You'll be very happy and the light output will be far superior to what you currently have. And I'll even offer to help you as it appears you are in my neck of the woods. I will start this by saying that the housings needed replaced with or without the HID conversion, as the first photo taken next to Sheryl’s 2001 Subaru shows. Spend $550 for LH Drive Euro Spec Glass housings or $280 +/- for junk US plastic housings? That was money that needed to be spent one way or the other, so I don’t count that cost. LH Drive Euro Spec Glass housings with Halogen bulbs installed. LH Drive Euro Spec Glass housings with Hid conversion installed. I had this setup checked and aimed by a local shop. They were impressed with the light output and the pattern, having seen some of the early kits that did splinter the light everywhere. We have done some driving tests with the Subaru in front of the 7 at varying distances from up close to 2 football fields back. She said it seemed no brighter than a true projector Hid. When we went out for a test drive on lots of different roads from 2 lane country, undivided 4 lane, divided interstate and city streets, no one flashed their high-beams at us. I did not expect them to. I will start this by saying that the housings needed replaced with or without the HID conversion, as the first photo taken next to Sheryl’s 2001 Subaru shows. Spend $550 for LH Drive Euro Spec Glass housings or $280 +/- for junk US plastic housings? That was money that needed to be spent one way or the other, so I don’t count that cost. First, thanks for sharing the results. With the hammering you were taking, it's difficult to come back and post up the conversion pics. For that, I applaud you. Now, unfortunately, be prepared for the flamage. What you've created is a bunch of light output above the cutoff line and this is what will blind oncoming drivers and is a safety problem. See the sharp cutoff on the bottom pic and no light bleed through above the line? Now look at the flare up of your cutoffs and the large amount of light above the cutoff. It's the flare up and the light above the line that we've been trying to tell you will occur with what you've done and it is this that will be incorrect. 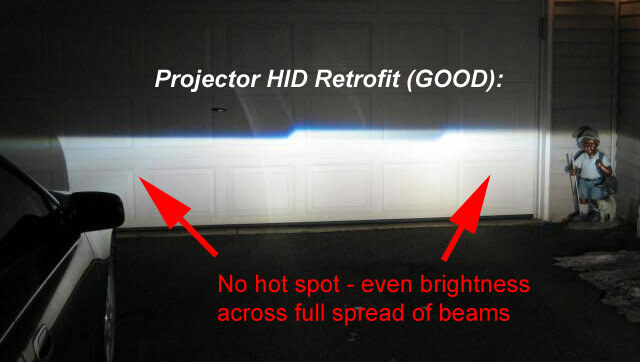 Yes, what you have is better than the illegal HID beam pattern Scrub posted up for comparison but (there's always a "but" right?) what you have done is far from ideal and will most certainly be a safety hazard, regardless of whether you were flashed in your test drive. It's okay to have a little light bleed through above the line as DOT standards allow some versus Euro patterns - the theory here is the US believes the sharp cutoff is not good for the driver as the contrast above and below the line are too great versus the Euro's thinking that the sharp cutoff is better to avoid blinding oncoming traffic. But as time goes on, the standards are morphing together anyway. Your pattern, however, allows way too much light through in the center of the pattern as well as the dramatic flares on the right. No way this is good. I know this takes a lot of work to have done what you have accomplished. Now that you know how to do the retrofit part and now that you have the clear glass lenses, why not put in the retrofit.com projector setup? You'll pretty much break even on the deal and you'll have vastly superior and safe light output. Plastic is more optically clear than glass but those e-codes with halogens do look very good. 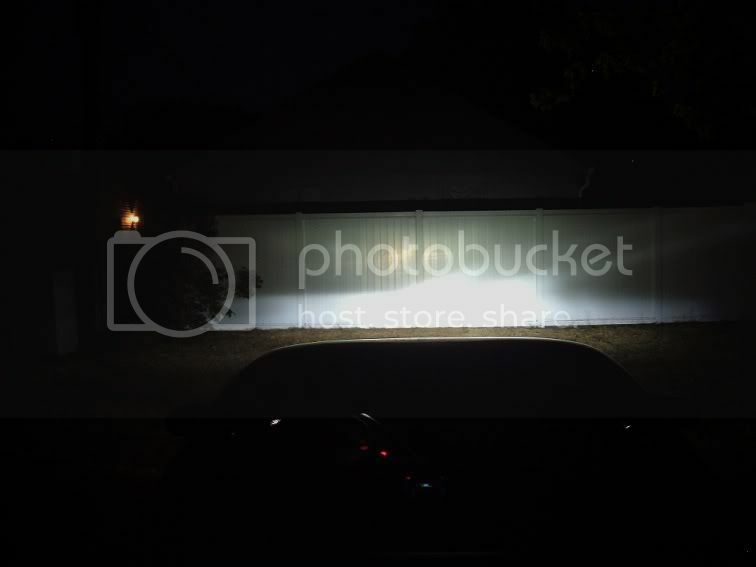 Initial test of the shielded HID bulb in the 19 year old OEM plastic head light housing with no mods to the housing or the bulb resulted in a near perfect Halogen beam pattern and no stray light rays. We used the standard distance of 25ft to see the pattern. Some more test photos to come when work slows down. This having to work keeps getting in the way. I am pretty sure you are missing the point compare your halogen beam pattern to the one with hid in it. Notice the extra glare above the cutoff line on the hid that the halogen does not have? That is what is wrong along with that extra foreground lighting too. No matter how many test or "experts" see it, it is still not correct and will never be correct. Its impossible to align a hid capsules TWO hotspots with a halogens ONE hotspot. I'm convinced that this guy is ignorant and isn't seeing the big picture of what we've been trying to tell him. Some people never learn and id leave it at that. Another big problem with non-projector HID setups is that it creates a "hot spot" that causes you to actually have WORSE "night vision" (i.e. your pupils contract, letting in less light). 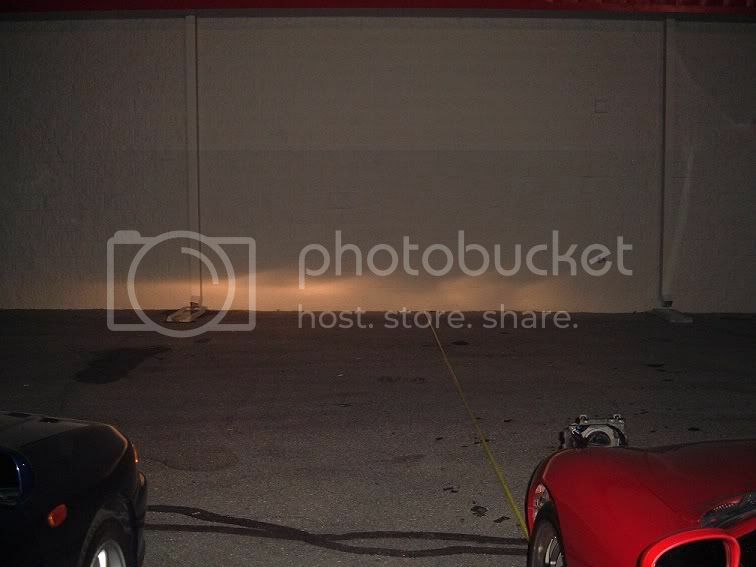 HID bulbs put out more light, creating a "hot spot" right in front of the car. Your eyes automatically adjust to this level of brightness. This means if you look anywhere besides directly in front of the car, your eyes aren't adjusted properly and you can't see as well. So, besides the glare you cause to oncoming drivers, your own vision is negatively affected. ^ Notice how you can't see the detail of the fence in the "hot spot" area? As you get further away from the center "hot spot" the light is dimmer. This is bad for your eyes because it will harm your "night vision". 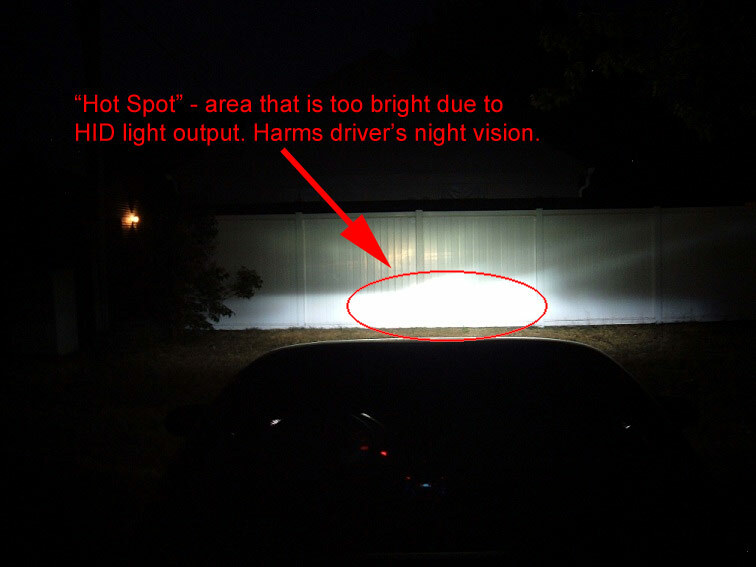 ^ There is not a "hot spot" and the brightness is even across the entire width of the projected beam. This will not harm your "night vision" because the brightness is the appropriate intensity and the area in front of the car is evenly lit. 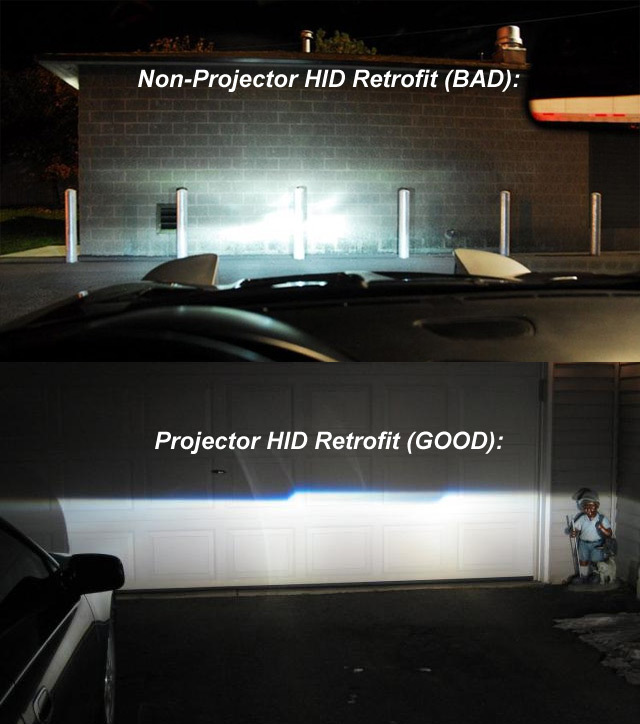 IIRC, this is one of the reasons why automakers didn't sell cars with non-projector HID for very long. When you use a projector HID setup, you're getting even brightness of light across the entire lit area, so your eyes stay better adjusted. So, OP, you've spent $940 making your headlights just as dangerous as they were in the first place. Instead of being too dim, now they're too bright, and the light output pattern is worse as well. You should have just bought a set of the SakeBomb projectors headlights, or hell, retrofitted some projectors yourself (as David suggested earlier) if you really wanted to DIY. You need to make your lights look like this. SakeBombGarage HID retrofit. Guys - No need to be insulting or name calling. Stop that pronto or get a vacation. Follow forum protocols and rules on treatment of other members. Are people really driving FD's at speeds of 100+ at night? Lol I suppose the admin note in red is directed towards me. Can't help natural selection isn't quite doing its job. As for driving 100+ at night. I'm sure there are plenty of people doing it. Some need to do it with their lights off anyways. 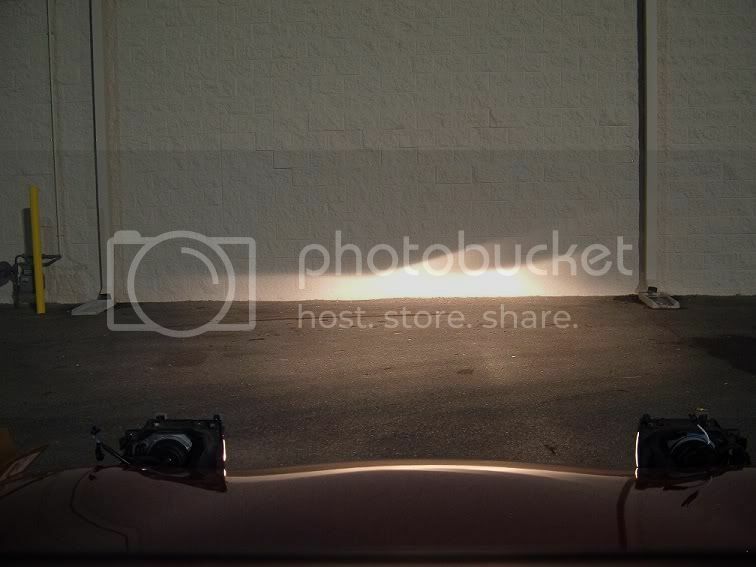 B) the stock lights arent safe at 45mph... it's like driving with a flashlight. I've got the repair receipts from a deer impact many years back to prove it. To the OP: You're not understanding what everyone is saying or you don't want to hear it, but I'll repeat it again. I did a 2 year study on the effects of headlight glare on oncoming traffic which is currently awaiting publication... I won't go into it further but suffice to say I've done my homework and know what I'm talking about. The light bleed above your cutoff is what is blinding oncoming traffic. See all the light above your cutoff? Have someone else drive your car towards you... it's going to blind oncoming drives (disproportionately and much more severely older drivers as well). But, even that aside, you haven't made YOUR vision any better. Look at the location of the light in your beam pattern... it's all in the center, and nothing out to the sides. So you're in essence shining a ton of light in the center of your visual field. What happens when your eyes see very bright light? Your pupils close to adjust to the lighting intensity. When your pupils close you can see the bright areas just fine but you are letting less light from the dimer areas into your eyes (so you can actually see WORSE in your peripheral, and dimly lit areas of the roadway actually appear DARKER than the center bright areas you are lighting up). Then there is throw... take your car out on a road (not a wall) and we can describe the problem here as well. Basically you have a very even lighting pattern top to bottom on the wall.... but your lights shine in 3d down the road. So if you imagine your lights at the very top of the cutoff shining all the way down the road at long distances, and the lower areas on the wall as shining in your foreground... to evenly light distance and foreground the same way you need a differing lighting intensity top to bottom (brighter light at top gets spread out over more distance down the road, and dimer light at the bottom gets spread out over a short distance close to the front of your car). There are many factors that play into a proper lighting setup and your bulbs have none of these features. The kicker is if you would have asked here, we could have explained all this before you spent over $300 on these units (you got ripped off unfortunately as they routinely sell for 50-75 bucks). OP... here's a gif of a projector HID setup. Notice the even lighting left to right. Notice the even lighting foreground to distance. Notice the distinct lack of light above the cutoff. All of these things not only make the lighting itself better, but improve the interaction of your own EYES with that light (not to mention the interaction of the eyes of oncoming drivers in the presence of your headlights). Let's play a game: associate those bushings!